Benjamin “Ben” Cohen left a career as a heating and air conditioning mechanic to pursue his dream of serving in the medical field. He began his medical career as a phlebotomist working in a busy emergency room. While observing the ambulances constantly moving in and out of the ER, he decided that was where he wanted to be. 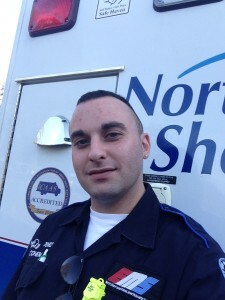 He obtained his EMT card in 2013 and began working at Northwell Health CEMS shortly thereafter. While Ben is relatively new to EMS, he has developed a reputation as a role model to others, as someone who always has a smile on his face, and a leader who always demonstrates the highest level of compassion for his patients. Ben seeks ways to help out his department, accepts assignments without complaint, and consistently maintains a friendly demeanor. Ben was overwhelmingly chosen by his peers as a Star of Life. When he is not working, Ben loves spending time with his two-year-old son, Dylan.